Olssen is a Dutch company that has been selling lockers in all kind of sizes and colours since 2004. When customers wish to buy a locker they first want to be sure it fits the available space and the interior. To simplify this process Olssen wished to create an AR application that could help them with their decisions. 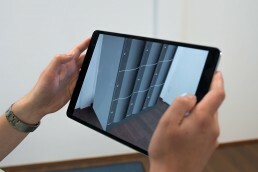 "Simplify the purchase process by means of an AR application"
An iOS application has been created that has three functions: measuring the real environment, visualizing the lockers in AR and requesting a quote. 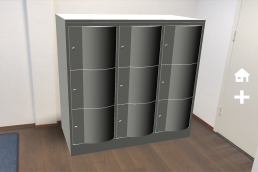 All lockers from the product range are added to the application. These can be placed in any room with the right sizes. This gives customers a good idea of the lockers in a certain setting and the dimensions that are needed. After this, a quote can be requested in the application. A system has also been created through which the client can add new data. This allows the product range to stay up to date. Olssen was really satisfied with the created application. With the application Olssen’s customers can visualize lockers in each room. This allows for a better idea of the potential buy which simplifies the decision.